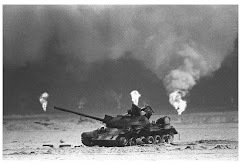 Approximately one in three 1991 Persian Gulf War veterans suffers from a multi-symptom illness. Follow these steps to seek treatment or VA compensation. The health conditions often are attributed to anti-nerve gas drugs given to troops and pesticides used during the war. Pyridostigmine bromide, which was administered to troops, had not been approved for nerve agent protection. Yet the specific links still are not [fully] understood. A review by the National Academy of Science’s Institute of Medicine concluded that [one] illness clearly caused by the Gulf War is post-traumatic stress disorder, present in 2% to 15% of Gulf War vets, depending on how it is diagnosed. Health System, told the American Forces Press Service in April 2010 that Gulf War veterans should seek care through VA rather than private doctors. That way researchers can continue to track their data and search for causes of their symptoms. In March 2010,VA announced that it would take a second look at disability claims related to Gulf War Illness, as well as train its medical staff to make sure not to tell vets that their symptoms are imaginary. If you are a Gulf War veteran, what do you do? Brucellosis*: A bacterial disease with symptoms such as profuse sweating and joint and muscle pain. Campylobacter jejuni*: A disease with symptoms such as abdominal pain, diarrhea and fever. Chronic fatigue syndrome: A condition of prolonged and severe tiredness that is not relieved by rest and is not directly caused by other conditions. Coxiella burnetii (Q fever)*: A bacterial disease with symptoms such as fever, severe headache and gastrointestinal problems such as nausea and diarrhea. Fibromyalgia: A common condition [among Gulf War veterans] characterized by long-term, body-wide pain and tender points in joints, muscles, tendons and other soft tissues. Irritable bowel syndrome: A common disorder [among Gulf War veterans] that affects the intestines (colon) and causes cramping, abdominal pain, bloating, gas, diarrhea and constipation. Malaria*: An infectious disease caused by a parasite. Symptoms include chills, fever and sweats. Mycobacterium tuberculosis*: An illness that primarily affects the lungs and causes symptoms such as chest pain, persistent cough,weight loss and fever. Non-typhoid Salmonella*: A condition characterized by symptoms such as nausea, vomiting and diarrhea. Shigella*: A condition characterized by symptoms such as fever, nausea, vomiting and diarrhea. Visceral leishmaniasis*: A parasitic disease characterized by symptoms such as fever, weight loss, enlargement of the spleen and liver, and anemia. West Nile virus*: A disease spread by mosquitoes characterized by symptoms such as fever, headache, muscle pain or weakness, nausea and vomiting. With the new rule, a veteran only needs to show service in Southwest Asia (also applies to Afghanistan), that he or she had one of the diseases within a certain time after service, and that he or she has a current disability as a result of that disease. However, seven of the diseases are subject to certain time limits. Veterans who think they have been exposed to environmental hazards during military service and would like an evaluation should contact an environmental health coordinator at a regional VA medical center. VA maintains a health registry evaluation program to track the health of veterans as described above. 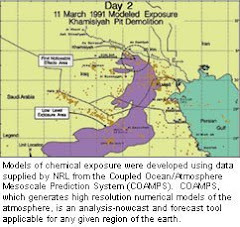 Gulf War (and Operation Iraqi Freedom) exposures may include pesticides, infectious diseases, chemical and biological warfare agents, oil well fires and depleted uranium. A listing of coordinators is available online at www.publichealth.va.gov/exposures/eh_coordinators.asp. Information also is offered through the VA special health issues helpline at 1-800-749-8387. The health registry evaluation is available free of charge to all eligible veterans. Veterans do not need to be enrolled in VA health care to be eligible. • A free specialized health evaluation. • Answers to questions about environmental exposures. • Information on health care and other VA benefits. • Test results shared and maintained in VA medical records. However, note that a Gulf War Registry examination is not a claim, nor is it required for VA health care benefits or disability compensation. As of March 2010, 116,628 initial examinations had been performed,with 6,896 follow-up exams—a 5.9% follow-up rate. To receive the Gulf War Review VA newsletter via e-mail, sign up at www.easmailcall.aac.va.gov. • Contact a veterans benefits counselor at the nearest VA regional office or health care facility at 1-800-827-1000. • Submit claims online at http://vabenefits.vba.va.gov/vonapp. • Call the VA Gulf War Information Helpline at 1-800-PGW-VETS (1-800-749-8387). VA credits VFW for being “very helpful to Gulf War veterans.” To find a VFW service officer, go to www.vfw.org/Assistance/National-Veterans-Service. As of September 2010, the basic VA compensation rate for veterans without dependents ranges from $123 to $2,673 per month, depending on disability. • A five-year study will evaluate the impact of resistance exercise training in treating chronic musculoskeletal pain and associated symptoms in GulfWar veterans. • A four-year study on an animal model of Gulf War illnesses will assess the effectiveness of therapies to enhance mood and memory. • A two-year pilot study will include eight-week trials of “mindfulness based stress reduction,” compared with traditional care. Search for “Gulf War Illness” on Clinicaltrials.gov to view recent studies, as well as those recruiting eligible veterans.